1939-40. 3-storey rectangular plan flat-roofed former Control Tower with reduced 3rd storey to accommodate observation walkway and further small upper observation deck. Incorporates crash tender garage to S elevation. Smooth cement rendered brick. Multi-pane metal casement windows. Interior room plan extant. Concrete stair with timber handrail. The Control Tower is noted as building number 1 on the DTZ/LDN report. 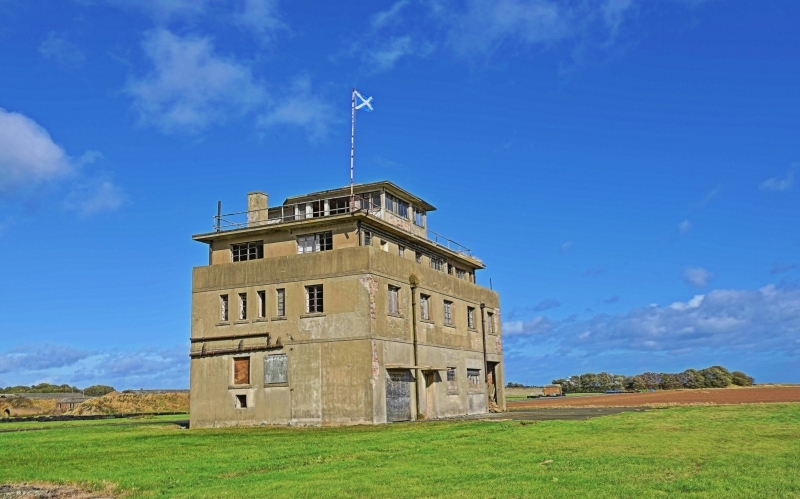 The Crail Control Tower is a particularly rare survival. The general design is unique to Naval Air Stations. Only 2 of this particular type, with an incorporated ambulance and crash tender garage to the ground floor, are thought to have been constructed. The other example, at RM Condor in Arbroath, has been altered and the Crail building is therefore the best example of its type.